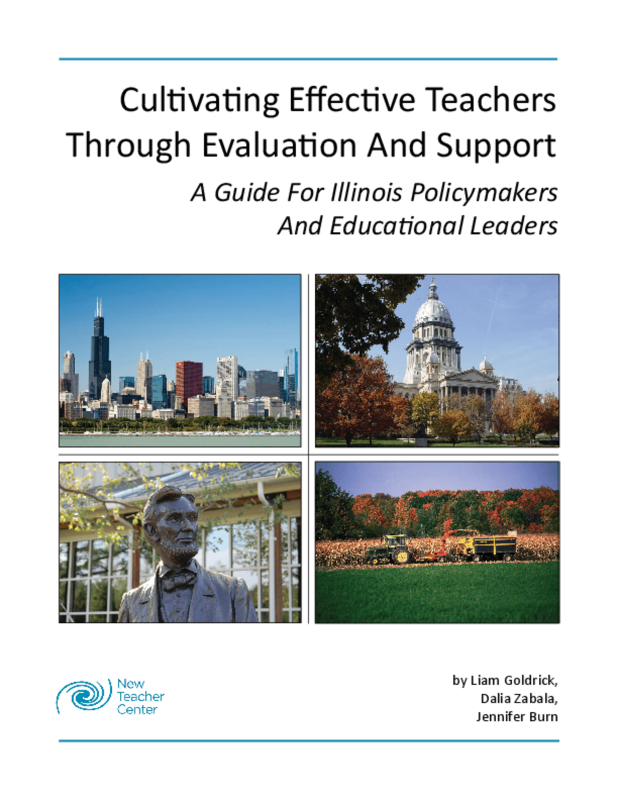 Reform of educator evaluation, in Illinois and around the nation, is intended to more accurately identify effective and ineffective teachers and to inform teacher development. The reality is that more effort and attention has been focused on how to rate teachers within such systems than on how to design these systems to provide regular and useful feedback on teaching. If the 2010 Performance Evaluation Reform Act (PERA) is to achieve its aims in Illinois, it must help teachers to learn and improve on the job. For beginning teachers, the challenge is more pronounced. On average, new teachers are less effective than their more experienced peers. Improvements in individual teaching practices tend to occur during these early years in the classroom, when teachers are applying lessons learned during preparation and developing their own pedagogical approach. While beginning teachers should not be held to a different performance standard, they do require more intensive support and more frequent feedback to grow into highly effective practitioners. This is one reason why highly structured, intensive new teacher support is prized by beginning teachers -- and strengthens their teaching. If PERA is to accelerate new teacher effectiveness, beginning teachers in Illinois will require more feedback and support than what is provided by this law alone. An aligned system of high-quality induction -- featuring regular contact with a mentor, frequent classroom observation, on -- going opportunities to engage in reflection and self-assessment, and actionable, "real time" feedback to inform instructional improvement throughout the school year -- would provide the necessary intensity of instructional support. To accomplish this, Illinois should design and articulate a comprehensive talent development system with teacher learning at its center. Illinois is well-positioned to succeed. Its deep commitment to successful PERA design coupled with a gradual approach to implementation has put the state on the right track. Its existing induction program standards and new induction rules lend important tools to the effort to address the unique learning curve of beginning teachers. This Guide explores how the state can solidify PERA's role in informing and supporting new teacher development. In this effort, we have identified two main priorities for Illinois policymakers and PERA implementers. Design a comprehensive educator effectiveness system that encompasses both evaluation and robust instructional feedback and support. For new teachers, this system must include induction support aligned with PERA's evaluation requirements. Encourage and enable teacher leaders to serve as teacher mentors and as peer evaluators. Instructional improvement is a collective responsibility and is too critical and time-intensive an endeavor to leave solely to school administrators. Copyright 2013 New Teacher Center.